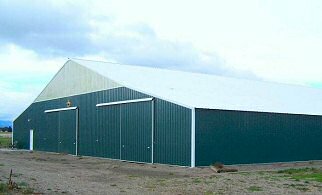 "Champion Steel Buildings constructed a garage on my property in 2007. The crew did an excellent job. They kept the schedule as promised. Thanks Scott for a great building!" "Fast, efficient, and well priced. Champion Steel Buildings did a great job. Thanks Scott for taking care of us and making this a pleasant experience." "When you chose the name for your business, you meant it whole heartedly. You are truly the 'Champion' of steel buildlings from beginning to end. You and your crews took pride in constructing our building with the utmost professionalism and remained on schedule as promised. We are not able to thank-you enough." "Scott, You were right on schedule and kept to the original estimate. We absolutely love our new steel roof. Champion Steel Buildings,Inc will always get our future business. Well Done!!" "We have found Scott Cook and all his work crews to be very professional, reliable, efficient, and fast. Our experience in all three of our building projects has always been a pleasure." "Champion Steel Buildings went the extra mile and held to their original bid. Thanks for your excellent work at a great price." "I have been a resident in CDA for over forty years. It's been my dream to someday have a shop. Having been in the building industry for that time, I was able to finally fulfill my dream. I chose Scott Cook as my contractor. I could not have been more pleased with my project." Allow us to give you a free on-line quote on your next project. Not ready for a quote? Email us and we'll mail you our Information Packet This packet includes our brochure, color swatches, garage door brochure, and references. Please include name, phone and mailing address in your email. See the Kootenai County Snowload Map (13Mb) for engineering requirements on your specific site. Copyright © Champion Steel Buildings, Inc. All rights reserved.